We love to travel. I imagine that this was instilled in me as a child when I would accompany my parents to the country of their birth, Antigua & Barbuda, every couple of years for several weeks each summer. I know that my husband only realized the possibilities travel opens to you on his first trip to Antigua in 2004. Over the last 10 years we have been extremely fortunate to have travelled to many fascinating places all over the world. It made sense to us that, when we decided to formalize our long-term relationship with marriage, we would head south from Canada and do so on the largest of the Leeward Islands. Brian had always wanted to introduce his children to Antigua and the prospect of a holiday with a group of people who mean a lot to us was irresistible. So, we sent ‘save the date’ cards two years in advance (I am a bit of a planner!) to encourage our family and friends to join us. In late 2013, with preparations and planning in full throttle, I saw an article in the newspaper about Pack for a Purpose (PfaP). We had just returned from a trip to Europe so I filed it away for our next holiday. About the same time, we started receiving questions about wedding gifts. While we truly appreciated the generosity, it was enough of a present that our guests were joining us in Antigua for our wedding. But, we understood that people felt that they should do something for us to mark this milestone. 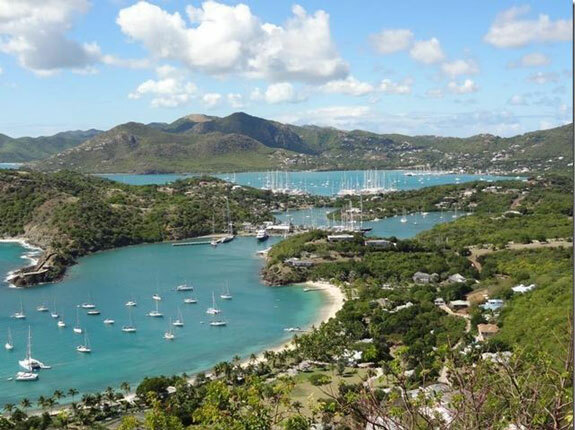 Further, my parents had left “the land of sand and sea” in the late 1960s to afford their children more opportunities, and we were looking for a way to give back beyond supporting Antigua’s biggest industry (tourism). In February 2014 when I was looking at the 2014 edition of “The Antiguan” online, Pack for a Purpose popped up again and something clicked (http://issuu.com/theantiguan/docs/the-antiguan2014?e=4030503/5703532). We became really excited at the prospect of our guests supporting a school in Antigua through Pack for a Purpose. Rebecca Rothney responded to my question via the website about getting involved by asking our wedding guests to consider bringing items for the program for schools in Antigua. 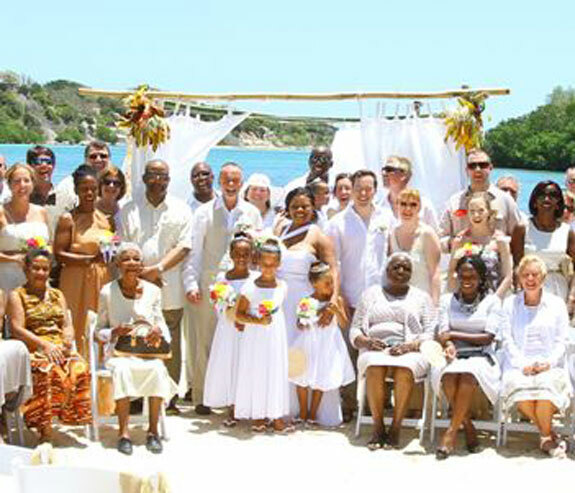 We would be the first destination wedding in Antigua to participate and, with over 60 of us travelling to Antigua from Canada and the U.S., we hoped that most of them would want to try to make a difference! As our hotel, The Verandah Resort and Spa, was not yet affiliated with PfaP, we found that we could participate with Sandals Grande Antigua Resort & Spa through the Sandals Foundation. With our resort located just outside of the Village of Willikies, we hoped there was a school in that area that could benefit from our support. 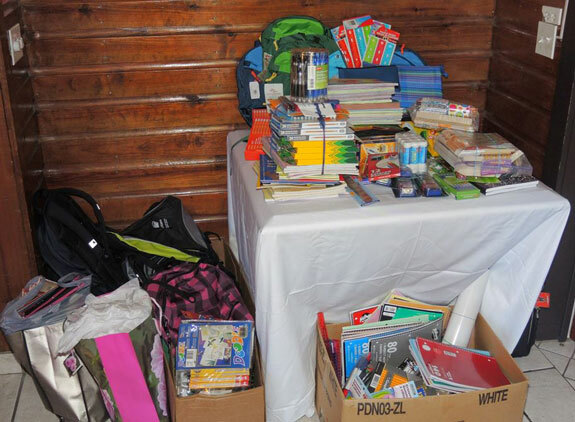 The Sandals’ Foundation quickly confirmed their partnership with the Willikies Primary School and worked with the school staff to come up with a list of needed supplies. Within ten days we were able to share our excitement about PfaP through our wedding website on destinationweddings.com. We made sure that we took the time to explain why school supplies instead of a cash donation made sense. Initial feedback from our guests was terrific. We began our personal shopping and made plans to have a Sandals Foundation representative make an appearance at our brunch reception. In the meantime, Rebecca made her appearance on NPR (formerly, National Public Radio) and mentioned our plans to incorporate “packing for a purpose” into our destination wedding during her interview (http://hereandnow.wbur.org/2014/03/17/pack-purpose-travel). As requested, on their arrival in Antigua, our guests brought their donations to the wedding brunch reception. We knew that several of guests had brought supplies with them, but were overwhelmed with the generosity we saw! The pile was huge! 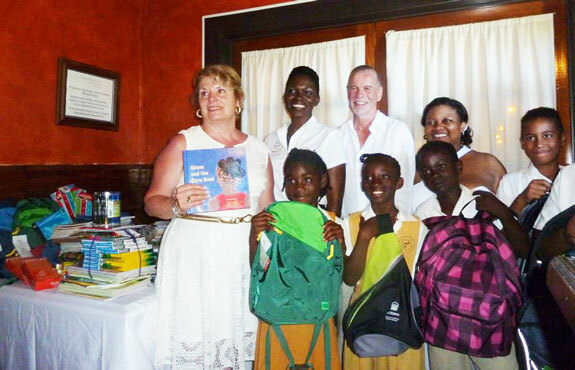 Unexpectedly, the Sandals Foundation representative was joined by a Willikies school teacher and five students! The gratitude and joy our surprise guests expressed, in smiles and song, topped off a fabulous and unforgettable day. We would like to thank Pack for a Purpose for adding immeasurable joy to our wedding day and for allowing us to bring joy to others. We hope that we night encourage other destination wedding couples to consider doing the same!